Michael Ammermüller is the new champion of the Porsche Mobil 1 Supercup. 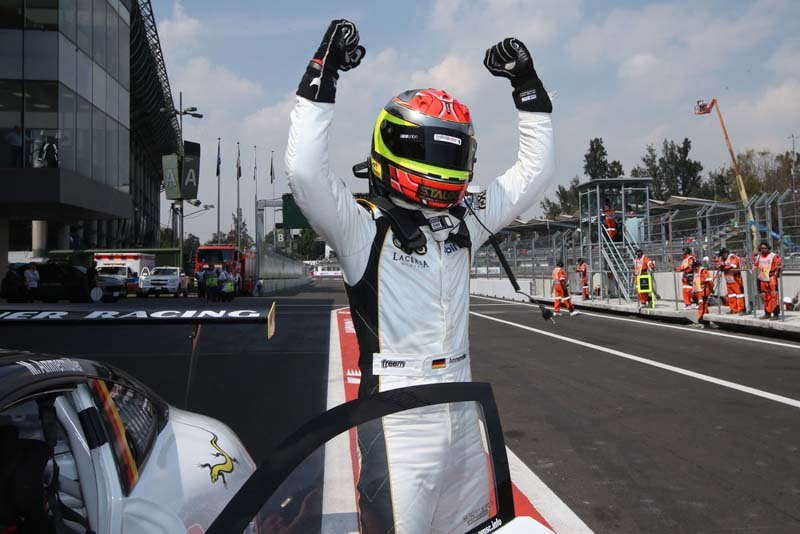 The 31-year-old German, who competed for the Lechner MSG Racing Team, secured the championship title on Sunday at the final round held in Mexico City. Victory at the last race of the season, however, went to Porsche Junior Matt Campbell (AUS/Fach Auto Tech) ahead of Ammermüller and Porsche Junior Dennis Olsen (N/Walter Lechner Racing Team). Second place was enough to give Ammermüller a seven-point advantage to claim the crown. “Four wins, five second places and a third – thanks to these consistent performances I was finally able to win the Supercup. I’m very pleased about that and I’m grateful for the terrific support I received from my Lechner team,” said a beaming Ammermüller. Spectators were treated to an exciting eleventh round with 30 Porsche 911 GT3 Cup racers lining up on the Autodromo Hermanos Rodriguez. Pole-sitter Campbell made a cracking start to maintain his lead position, with Ammermüller and Olsen slotting in behind him. For the next eight laps it looked as if the Australian would easily convert his pole into victory, however Ammermüller had opted for a different tyre strategy and, at the midway mark, began to put Campbell under increased pressure. The frontrunner, however, kept his cool and brought home his second victory of the weekend after finishing first in Saturday’s race. “It’s fantastic that I managed to achieve a double victory in Mexico. What a great end of the season for me and my team! I have to say that the competition was incredible at every race this year. For me as an Australian, every racetrack was new territory and I first had to gain experience. Third overall in the championship is absolutely fine,” said Campbell, summing up his year as Porsche Junior in the Supercup. Olsen rounded off the podium next to Campbell and Ammermüller. “I did my very best in today’s race, but ultimately it wasn’t enough to take the title. It’s my first year in the Supercup and prior to the season I hadn’t imagined that I might be fighting so closely for the championship,” explained Olsen, who concluded his season as runner-up, seven points behind the champion. For Josh Webster (Fach Auto Tech) from Great Britain and Porsche Junior Thomas Preining (Walter Lechner Racing Team) from Austria, the race concluded with positions four and five. “That was a nerve-racking race for me. I had lots of incredible duels and I kept losing places, but I managed to regain them. In the cool-down lap I looked at the grandstands packed with people. It’s truly impressive how much the Mexican people love their motor racing,” said Preining. Sixth place went to Zaid Ashkanani (MRS GT-Racing) from Kuwait, with Mattia Drudi (I/Dinamic Motorsport) taking the chequered flag in seventh. Robert Lukas (PL/Olimp Racing) secured eighth place. Thus, the top eight drivers came from eight different countries. After eleven races run as support to the Formula 1 races, the championship titles have been awarded. Ammermüller is the 2017 champion with 193 points. The vice-championship went to Olsen with 186 points, who also took home the title as the best rookie. Campbell scored third overall with 151 points. In the B-classification for amateur drivers, Frenchman Roland Bervillé (Martinet by Almeras) won with 166 points over Egidio Perfetti (NL/MOMO-Megatron Team Partrax, 162 points) and Roar Lindland (MRS Cup-Racing, 152 points). The team championship was awarded to Lechner MSG Racing Team. In the Nations League, Germany came first (195 points) ahead of Norway (188) and Australia (159).